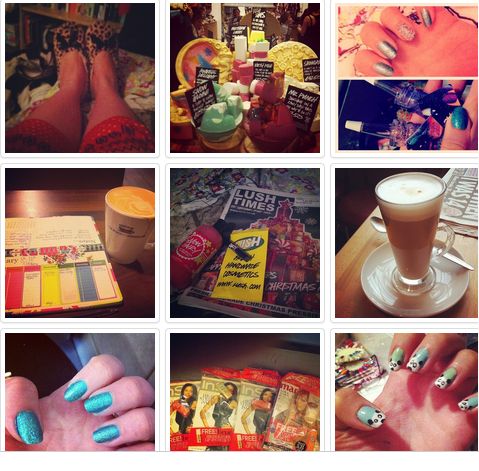 So another week has been and gone... not many pictures on the ol' Instagram in the past week... It's been a busy one and I'm thoroughly looking forward to the thought of having a week off college as of Thursday at 4pm! :) It'll give me some much needed time to get on with coursework and of course blogging time :) Friday will be my first day off in a few weeks so it'll be devoted to watching movies I feel a movie day in my jammies is long overdue! 1. New jammies and slippers :) these jammies are so cute they have a cute grey t-shirt with raccoon wearing a scarf on it, amazeballs! and super cosy leopard print slippers :) both from good old Primark! 2. All the Christmassy soap at Lush, just looking at this picture makes me smile and think festive. 5. Friday Lush treats :) Snow Fairy and a little bottle of Dirty perfume. 6. Enjoying a latte in a cute cafe in Edinburgh before my Journalism conference. 8. Magazine splurge... So I bought 3 copies of InStyle so I could get one of each of the Benefit samples and Marie Claire for the gorgeous L'Occataine mango hand cream! The woman in WHSmith was very confused.. So that was this past week in pictures, I had a pretty good week actually, how's about all of you? Who else went a little magazine crazy? No... just me? Well this time I'm definitely going to bed, night all!